Decatur, GA – On Friday, March 16, 2018, Jermaine Montrel Johnson, Lindsey Michelle Anderson, Justin Phillip Lee Adams, and Crystal Denise Hall were arrested in Stone Mountain, DeKalb County, Georgia culminating a months-long investigation by agents with the Georgia Bureau of Investigation (GBI) West Metro Regional Drug Enforcement Office. 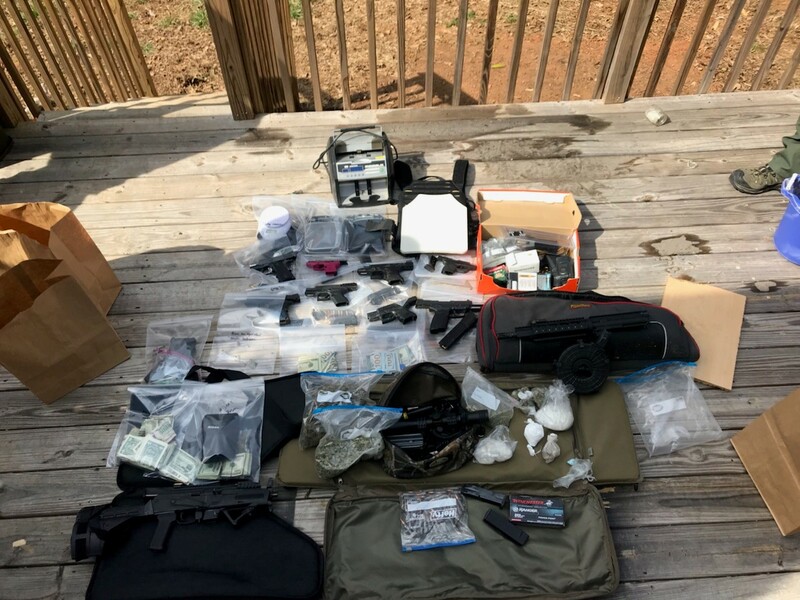 Law enforcement agents developed information that Johnson, 35, was distributing methamphetamine and heroin from his residence in Stone Mountain. A search warrant was executed at Johnson’s home located at 832 Post Road Circle. Agents seized marijuana valued at $11,000, powder cocaine valued at $6000, methamphetamine valued at $28,000, heroin valued at $12,600, and a quantity of Xanax and Oxycodone pills. Agents further discovered $10,099.00 in US Currency. Agents also found nine firearms, two of which were confirmed stolen, a bullet proof vest, high capacity magazines, a large amount of ammunition, and one stolen motorcycle. Johnson was charged with the sale of methamphetamine and heroin, trafficking of methamphetamine, trafficking of heroin, trafficking of cocaine, possession of marijuana more than one ounce, possession with intent to distribute marijuana, possession of a schedule II narcotic, possession of a schedule IV narcotic, and nine counts of possession of a firearm by a convicted felon. Anderson, Adams, and Hall were charged with trafficking of methamphetamine, trafficking of heroin, trafficking of cocaine, possession of marijuana more than one ounce, possession with intent to distribute marijuana, possession of a schedule II narcotic, possession of a schedule IV narcotic, and nine counts of possession of a firearm by a convicted felon. Also assisting in the investigation was the DeKalb County SWAT Team and the Spalding County Sheriff’s Office. Johnson and Lindsey Anderson, 31, are being housed in the DeKalb County Jail on the listed charges. Justin Adams, 24, is being housed in Spalding County due to an outstanding warrant. Crystal Hall, 27, is being housed in Henry County due to an outstanding warrant. Adams and Hall will be transported back to DeKalb County at a later date for the warrants taken as a result of the search warrant. The GBI West Metro Regional Drug Enforcement Office is in Carrollton, Georgia and services 30 counties. The office is comprised of members from the GBI, Carrollton Police Department, Villa Rica Police Department, Bowden Police Department, Lagrange Police Department, Peachtree City Police Department, Atlanta Police Department, Carroll County Sheriff’s Office and Heard County Sheriff’s Office.